Being Asian American and wanting to celebrate/preserve Asian American history in my own small way, I thought I’d do a card using an illustration from A Japanese Nightingale, a romance between an American and a biracial Japanese woman. A Japanese Nightingale, published in 1902, is likely the first English Asian American novel to become a Broadway play and a movie. In 1902, many states had laws banning interracial marriages between Asians and Caucasians. In 1907, a federal law was passed that Caucasian women marrying Asian men would lose their American citizenship until they were divorced or widowed. At the time, Asian men could not gain American citizenship — only Europeans and Africans could. Very few novels at the time dealt with biracial as main characters or as adults. The author herself was British Chinese raised in Canada who immigrated to America and returned to Canada after remarrying. She chose to pass as Japanese American due to the severe prejudice against Chinese when she first started writing. So while the book is a straightforward romance, it also dealt with race issues well before most people did. There were earlier Asian American novels and plays. Sadakichi Hartmann wrote the play Christ: A Dramatic Poem in Three Acts in 1893. New England Society for the Suppression of Vice publicly burned the play described as a “sensual and almost blasphemous drama” by Publishers’ Weekly. The play was immediately banned and Sadakichi was jailed. But I digress. The Genjiro Yeto illustration at the end of the book depicts the couple Jack Bigelow and Yuki reunited after much drama. I thought I’d like to do that one as a card. A lot of famous paintings appear on cards or in books and makes it affordable for people to be introduced to various artists. Historically there’s been many photographs on postcards of Asians living in America in costume. However there’s a dearth of Asian American art and photographs on postcards and cards. Luckily a few Asian American Museums have published books featuring historical art with accompanying cards/postcards but there is still much that disappears due to not being reprinted. I had bought A Japanese Nightingale a few years ago on ebay so I simply scanned the image. Only it’s not that simple. Back in those days, they used dot printing which obviously showed in the scan. So I had a problem. Genjiro Yeto was not famous enough that the original artwork had been scanned and placed on the ‘Net for all to enjoy so there was no way to work from the original. Yet the dots distract from the beauty of the art which I imagine was either a woodblock print or a watercolor and ink painting. Sighs. Vintage illustration from “A Japanese Nightgale,” 1903 edition, by Genjiro Yeto, page 224, scanned from book and slightly manipulated. A Japanese Nightingale by Onoto Watanna/Winifred Eaton, published in 1902, is likely the first English Asian American novel to become a Broadway play and a movie. Onoto Watanna/Winifred Eaton is known for writing many popular novels and also wrote for film. Her heritage was British Chinese but she adopted a Japanese American persona and lived it even in her private life. Genjiro Yeto illustrated a number of books, mainly with a Japanese theme as well as designed costumes for a Broadway play. He immigrated to the United States in about 1890 (immigrate being a relative terms as Asians were not allowed to become American citizens at that time) and returned to Japan in 1911 when newspapers spouting the dangers of the “Yellow Peril” grew antiChinese and antiJapanese sentiment to dangerous levels in the USA. He was unable to return. I guess that blurb needs to be shortened. It came out longer than I expected. And I have mixed feelings about using Yeto’s picture. It would be better to use the original but I like the adapted one better. No dots and has the feel of watercolor, ink and woodblock printing. I want to celebrate his work but by changing it, is that putting too much of a personal stamp on it so it is not only his. When I’ve been at auctions, if something is similar to someone’s work but not actually their work, they call it “In the style of ….”. so should I say “in the style of Genjiro Yeto” instead of “by Genjiro Yeto”. I don’t want people to think it is an exact copy of his work but I would like people to seek out his history and his other works along with Onoto Watanna/Winifred Eaton’s who is much more famous. Copyright is a nonissue because anything before 1920 is public domain according to USA law. Or should I just throw it all out? Forget Yeto’s illustration and do something from scratch with a nightingale and just celebrate the book? I know, I know. I’m confused. In doing a few things focused on Asian American history, I want to bring out other people’s work, not so much a focus on my own. I want to do a line of cards like that but it’s hard when you’re scanning from books and not the actual original artwork which is a quality problem. Or maybe do something more like a collage where I use a piece of his illustration, along with a nightingale. But then it’s not “preserving” historical Asian American art. It’s paying homage — which this feels like it is doing since it’s not quite the original either. Oh well, I’ll have to think on this some more before I upload it as a card. Color lithograph poster for Klaw & Erlanger’s production of “A Japanese Nightingale”, adapted from the novel by Winnifred Eaton (a.k.a. Onoto Watanna, 1875-1954) by William Young (1847-1920), at the Daly’s Theatre, New York, 1903 Broadway run. A Japanese Nightingale was written by Onoto Watanna. An unusual romance novel, the story is mainly from Jack Bigelow’s point of view. He visits Japan, intending only a few months, and swears not to take part in the custom of Western men “marrying” a Japanese woman for the length of their stay and then leaving her behind. Upon abandonment, the women are considered divorced. His friend, Taro is disgusted with this practice. Taro Burton is himself biracial. His British father married his Japanese aristocratic mother and although their happy marriage had lasted their lifetime, Taro reveals it was a hard life for biracial children. Taro is very prejudiced against such marriages. Taking up a scant two pages, Taro exits as his trip to Japan is delayed. Taro is a foreshadowing of the book’s premise. Bigelow falls for a biracial dancer, Yuki, who like Taro grew up in Japan. She makes it fairly clear she is marrying him for money and expects the marriage to end within a year. Though she scams him for money, Bigelow realizes it but gives her the money anyways plus adding extra into her stockpile once he discovers it. He knows she is lying but digs for the truth. She disappears for a few days at a time but comes back each time. The second time he follows her to a worn-down palace. She had told him she was a simple country girl. He doesn’tr eveal his foray. Yuki won’t introduce Jack to her family claiming that they would be upset she married a barbarian and refuses to go to public events with him. It becomes evident that she is falling for him too but still planning to leave him. She tells him it is better so. He becomes angry and possessive, determined to keep her, while they become increasingly estranged. He becomes bitter and she fearful. Taro arrives in Japan, letting his friend Jack know he had been stuck abroad until his family could finally send him passage money. Jack’s conversation about his wife puts Taro off, who is disappointed in his friend’s cynical attitude towards his Japanese wife. However, Jack convinces Taro to come to his house for dinner to meet his “sun goddess”. Upon meeting, Yuki cries out in horror and collapses at Taro’s feet. Taro recoils, looking sickened. It is, of course, Taro’s little sister. Yuki says sayonara to both of them and leaves the house. Together, they go looking for her but cannot find her. Taro and Yuki’s mother reveals that the family money had dwindled while Taro had been abroad in school. Yuki danced at tea gardens to earn money for the family and to send to Taro. When he needed passage money to come home, her mother persuaded Yuki to an arranged match with a rich American to gain the necessary money. Taro was sad and appalled that the family had become so impoverished that his sister had to sacrifice herself. The mother and daughter had kept it from him to spare his feelings. Jack continues to search for Yuki but Taro falls sick and passes. Jack goes from city to city following any lead. Meantime Yuki had left Japan, heartbroken her brother felt she had dishonored him but longing for her husband. She joined a touring group as it circled the Pacific Rim to pick up acts for an American tour The showman’s new bride takes pity on her and brings her back to Japan. Jack and Yuki are reunited and pledge their love and marriage forever. At the time, everyone believed A Japanese Nightingale‘s author, Onoto Watanna, was Japanese American. Actually it was a pseudonym for Winnifred Eaton, the daughter of a British merchant whose family disowned him when he married a Chinese woman, the adopted daughter of English missionaries. The family moved from Shanghai to New York and then to Canada . By age 14, one of Winnifred’s articles was published in a Montreal newspaper. Her writing career went on from there and included being published in Ladie’s Home Journal, a nationwide American magazine. Winnifred adopted a Japanese American persona because at the time she started in America, prejudice against Chinese was rampant. She lived as Onoto Watanna in her personal and writing life. She wrote a series of popular novels and magazine articles. 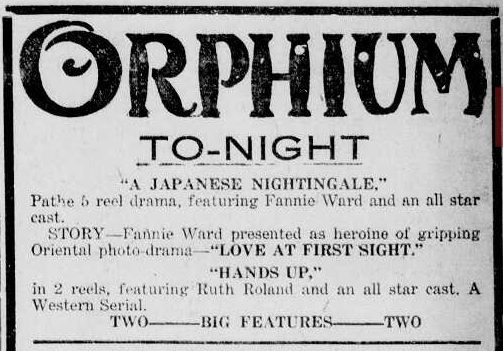 Later in 1918, A Japanese Nightingale became a silent movie starring Fannie Ward, an actress who became famous for playing ingenues twenty years younger. She also played the lead in The Cheat with Sessue Hayakawa, 1915, one of the few movies to give an Asian actor a lead role in that era. Remarrying in 1917, Onoto Watanna/Winnifred Eaton moved to Calgary with her Canadian husband, Francis Reeve and continued writing novels. In 1924, she went to New York to write screenplays for the new industry and then onward to Hollywood where she continued to work as a scriptwriter. Moving back to Calgary in 1932, she became involved in the local theater scene. Genjiro Kataoka who later became known as Genjiro Yeto was born in an Arita prefecture family that painted pottery. In 1893, he attended the Columbian Exposition World Fair at Chicago to market Arita pottery. Japan had only been forcibly opened to the outside world forty years ago by Commodore Perry. This was the first World Fair with Japanese representation. Japan created a wooded island with Japanese buildings which would influence visitor Frank Lloyd Wright for the rest of the time. The introduction of Japanese pottery, art and kimonos would spur a Japonism fervor among artists, influencing them for decades. It is no wonder that Genjiro moved to New York to study at the Art Students League. While he was a student, he also introduced Japanese painting techniques and styles. In 1899, Genjiro illustrated his first book cover, Tora’s Happy Day by Florence Peltier Perry. He became a popular book illustrator for Japanese themed books. Genjiro had his first solo exhibition in a New York Gallery in 1901. While Genjiro did his own art, he also imported Japanese art, taught flower arranging and tea ceremony, and continued promoting Arita pottery, the reason he originally came. He returned to Japan in 1911. Growing anti-Japanese sentiment fanned by newspapers spouting “Yellow Peril” made his return difficult. In 1910, Angel Island was opened, an immigration center for Asians. Unlike Ellis Islands more open philosophy, Angel Island kept as many Chinese and Japanese out as possible with interrogations that would last up to 86 pages long. A wrong answer meant deportation which was probably better than being locked up in Angel Island’s barracks for years. Families would send home their answers so that other family or village members could memorize them to hopefully pass the interrogation. Poems carved into the walls are a testament to the hell of waiting that was Angel Island. Unable to return to the USA, Genjiro eventually ended up working in a postal museum. His brand of merging Western and Eastern art methods widely praised in the United States was not viewed favorably in Japan and he could not continue working as an artist. Genjiro kept on creating art privately though. He died in 1924 of tuberculosis. That’s very cool and such an interesting history too. It’s a fascinating story, isn’t it? In some ways we’ve come far since those days, in others, not so far! I like what you’ve done with the illustration, and it’s obviously a lot of work to produce your final result. Thanks for reading! I appreciate it because i know it was bit long because it was both history of the book and then my working on the picture. I do think things are getting better — maybe not in every country but overall and in many countries. I agree with you though, sometimes it seems not so far when you hear how some people are talking or acting. I remain hopeful though.